According to Statista, the majority of revenue spent on worldwide videoconferencing and telepresence systems, 347 million U.S. dollars, was generated in the room-based video system segment in Q4 2014. Video infrastructure equipment ranked as the number two revenue segment at 136 million U.S. dollars, followed by personal videoconferencing systems at a distant 57 million U.S. dollars. 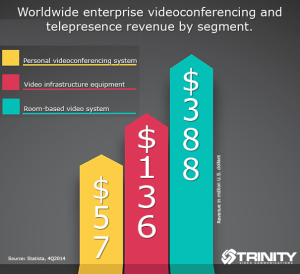 Comparatively, each segment increased from Q3 2014, showing signs that enterprise-wide videoconferencing continues to grow as companies look to the technology to help reduce costs and increase collaboration between employees. Interested in a videoconferencing solution for your organization, contact Trinity Video Communications at 1-800-261-9008. Trinity Video Communications is an audiovisual and video communications company that provides large corporations and healthcare organizations with state-of-the-art technologies that transform the way they communicate, interact and do business. Trinity Video also provides real-time unified communications to government agencies including the Department of Justice, Department of Defense, Homeland Security and law enforcement agencies at the federal, state and local levels responsible for mission critical initiatives. Trinity Video is headquartered in Louisville, Kentucky with additional offices in Sterling, Virginia and Cincinnati, Ohio.